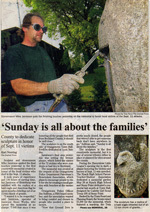 Praise for, and press about, Jamieson Stoneworks, LLC. Arriving at Michael Jamieson’s home and stoneworks in the quaint town of Sloatsburg NY, I noticed a large Buddha bust on the lawn where Michael was clearing away the spring snow. In the past years, I must driven through Sloatsburg a hundred times. This time, however, I came to visit Jamieson Stoneworks, LLC, a dynamic company specializing in stone veneer, fireplaces, walls, patios and sculpture. Stone mason and sculptor Michael Jamieson of Jamieson Stoneworks was commissioned to create the heirloom piece as a birthday present for an amazing father. A few years back I was given the opportunity to build a Fireplace for a Post and Beam House. Michael Jamieson is a master stonemason, who turns blocks of stone and marble into art sculpture and functional creations. His 21-year career has run the gamut of stoneworking. As a medium, stone packs more permanence per square inch than any other. For all the media that eons of nature have provided for shelter, protection, strength and expression, stone remains our most enduring thread to the past, and the most sustainable of the present. Thank you for taking the time to write. Your kind words of support and encouragement mean a lot to President Bush and me. Thank you also for sending the photograph of the granite sculpture carved by your husband. I appreciate your concern for our country. The positive spirit of Americans like you makes us very proud. 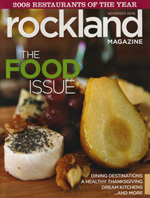 On behalf of the Board of Trustees of Rockland Country Day School, I would like to take this opportunity to convey our gratitude for your time and work in making our amphitheater become a reality. True craftsmen are hard to find, as are people who will work tirelessly to see that a great project is completed as planned, or even surpassing expectations. What a great example to set for the students of our school. Sculptor and stonemason Mike Jamieson applied the final countywide memorial created in honor of the local victims who died in the Sept. 11 attacks. 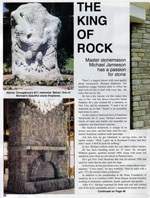 Master stonemason Michael Jamieson has passion for stone. 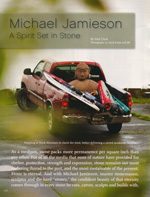 There's a rugged almost wild west quality about stonemason Michael Jamieson. His handsome craggy features seem to reflect the hard rocks he has to deal with every day, the rocks that are part of his life. It's rare for an artist to equally blend skill and experience with creativity and passion in their work. But such is the case with master stonemason Michael Jamieson, sculptor by trade and owner of Jamieson Stoneworks, LLC, who creates art from stone by hand cutting and carving each piece. Whether it is a sculpture, fireplace, veneer, patio, monument or pier, each project stands out. "I love stone. I love the history of it. I love creating from it. 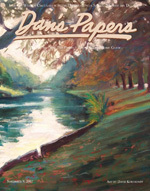 I get a great joy from doing it," he said.